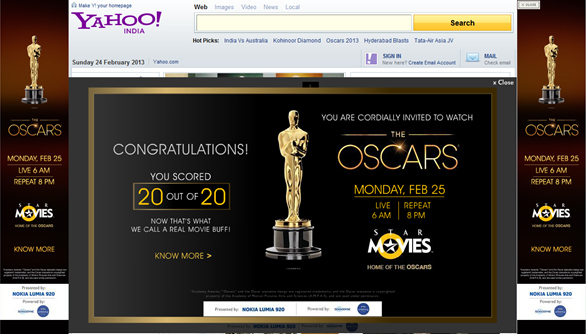 The Oscars will be telecast live on Star Movies tomorrow morning and the TV channel took over Yahoo! India's home page today with an engaging trivia Q&A within the rich media execution. It stood out as one of the best executions from this week. Do you remember the Charades campaign Star Movies executed for Oscars last year? Check it out here. Also check out the cool 'Spot the Difference' rich media takeover on MSN Brazil executed by Heineken.